THIS ARTICLE WAS WRITTEN BY KARTIK TYAGI, A STUDENT OF INSTITUTE OF LAW, NIRMA UNIVERSITY. Today’s world, post world war II, has come to be known as the world of rights. The fundamental rights were formally being granted in the wake of holocaust horrors. But this presented a different situation to India. India, a land of diversity, had just become independent and the constitution of India was on its way in 1950. The very challenge in front of constituent assembly was how to accommodate such diversity of India, into one codified law i.e. Constitution. The challenge was how to get people from different cultures, tradition, rituals and what not, to subscribe to one law of governance. But before moving onto how the constitution makers accommodated such multicultural Diversity, we shall focus, in brief, on the period of British rule in India. And especially how did the British, in its attempt to rule over India, dealt with such diversity; seen never before. The British worked for two broad goals: to extract economic surplus of the agrarian economy, and second, to sustain effective political control with minimal military involvement. The British divided all indigenous legal arrangements into two categories- Hindu and Muslim. Dividing all indigenous legal arrangements into two categories – Hindu and Muslim – was inadequate to contain the diversity of legal life in the subcontinent both within the Muslim community and between Hindus and Muslims. Within the Muslim community, for instance, unified Muslim personal law ignores all differences between Shia, Sunni, Ahmadi, Wahabi sects. Fast forward to 21st century, the personal laws in India have been a major political and controversial issue, especially the Muslim personal law. After the 1986 Shah Bano case, and the enactment of the Muslim Women (Protection of rights on divorce) Act thereafter, the debate has again got a central position. Apart from national political parties, women’s organizations and movements in India are also debating on issues like UCC, and women rights. In light of all such arrangements, it becomes all the more difficult to address the gender based issues, because it seems apparent that that the issues at community level are given priority over issues at gender (individual) level. This research shall try to assess this evolution of Muslim personal law in India from a socio-legal as well as socio-political aspect. But one of the main objectives of the research shall be to asses this evolution on the concept of community rights and gender rights. In assessing issue of women and law, the research shall try to shed light on-why community based issues are given more priority over gender based issues. Muslim Personal Law (MPL) in India has sources from Islamic laws and religion. During Prophet Muhammad’s time, there were numerous tribes, unstable local governments, and traditional tribal rules. At Medina, Prophet Muhammad assumed the functions of legislator, administrative general and judge. And many Suras (chapters of the Quran) containing rules about fasting, prayers, social laws covering marriages, divorce, etc, belong to the Medinese period. Therefore, on many issues the solutions are found in the revelations of the Holy Quran, which became the most important source of law. Thus Islamic Law was introduced by Prophet Muhammad through the Holy Quran and under his own directions during his lifetime. The overall spirit of the law was embodied in reforms in the then existing practices, such as introduction of females as heirs, prohibition of usury and abolition of infanticide especially of baby girls. This background and spirit that lies behind the introduction of the MPL should always be kept in mind. (i) Holy Quran: The Medinese Suras which form one-third of the contents of the Holy Quran relate to the period of victory and power and are rich in legislative materials. They deal with the institutions of public prayers, prohibition of wine, and matters related to marriage, divorce, adultery, inheritance, etc. Although the Quran is not in the form of any de nite code, either in form or in substance, it is the primary and nal authority in all matters with which it deals. (ii) Ahadis and Sunnas: Stories of occurrences concerning the Prophet given by eyewitnesses are known as Ahadis. Sunna is the practice of the Prophet. In the absence of any direct revelations from the Quran, problems had to be decided by supplementing the provisions of the Quran by facts from the life of the Prophet and from his sayings. (iii) Ljma: The third source is Ijma. The Quran and the traditions continued to have legislative effect but with the passage of time, it became necessary to deal with numerous problems which could not be decided with reference only to the Quran. For this purpose the jurists evolved the principles of “Ijma”. By this they meant the general concord among the jurists of a particular age on any question. Issues that were not mentioned in the Holy Quran and Ahadis were decided by consensus of opinion among the jurists. “Then I shall interpret with my reason”And thereupon the Prophet said: Praise be to God who has favoured the messenger of His Prophet with what the Prophet is willing to approve (Fayzee 1971: 8). While the world of Islam grew and the Prophet or his compan- ions could no longer directly help the cadis they were therefore constrained to exercise their own powers of reasoning and review of women’s studies deduction (literally, qiyas) and thus the principles of law grew and developed into a regular system (ibid: 8). Muslims are often wrongly perceived as a homogeneous block of people with uniform religious laws governing them. However, it is very often ignored that Muslims worldwide have many different practices, and have a large number of variations in laws govern- ing them within different Islamic countries and regions. Winsinck’s (1927) Handbook of Mohammedan Traditions contains classical collections of seven authoritative books on Muslim law. Two main sects are well-known – the shias (or shiites) and the sunnis. The shiites have four books of law: (i) the Ka – a collection compiled by Muhammad Ya‘qub Kulayni, (ii) Man la Yahduruhu’l- faqih by Ibn Bawayhi, (iii) the Istibsar, and (iv) Tahdhib al-ahkam by Shaikh Tusi (Fayzee 1971: 8). In the course of time four schools of Sunnite law came into existence in Arabia proper, Hana , Maliki, Sha ’I and Hanbali. Further to the east, another school, based upon the teaching of Imam Ja’far al Sadiq arose and was known as the Ithna ‘Ashariyya…The Hana School is followed by majority Muslims in central Asia, Turkey, Egypt and India. The Maliki was adopted in north Africa. The school founded by Imam Sha ’I was followed in Egypt and Sudan, south India and south-east Asia. The followers of Imam Ahmad ibn Hanbal were con- rmed to centre of Arabia, the Ithna ‘Ashari school spread over Iraq and Persia, and later in ltrated in India. A smaller school, founded by the Fatimid Caliphs in Egypt, was driven off from there, took refuge in the Yemen, and is now found preserved by Bohoras in western India (ibid: 8-9). Islamic jurisprudence then is better described as an ethical code rather than a uniform legal system. Various countries have different in practices, and have modified these laws in their own way. All Islamic countries also do not have uniform legal systems albeit claiming to be Islamic, and the local traditions and practices have been incorporated resulting in diversity. Muslims are generally thought of as a homogeneous block of people, being governed by a uniform set of religious laws. However, such is not the case, as many places around the world there exist Muslims who follow different practices and are being governed by a bit different set of legal rules, both in Islamic countries and regions. The very question at hand is, in the face of such economic, political , religious and other reforms, why there is always a rift between community rights and gender(individual) rights. In the 21st century, where the old boundaries are diminishing and new boundaries are being drawn, there is a dire need for analysis of conventional rules of governance, on the lines of collective and individual rights. On the other hand, there is also a different side to the story in which the women need to play an equal part. Women in their community don’t want ‘explicit’ right to choice over divorce and marry; they want changes in the existing ‘practice’ of marriage and divorce i.e. change in mere the procedural matters governing marriage and divorce. Rather the women need to raise voice for change in the substantive matters like right to chose whom to marry, right to opportunities after marriage etc. Therefore the main thing which comes out of this analysis is that, women need to be given their independence. There needs to be a massive overhaul of the opportunities at a woman’s disposal. Because it is only when she is made to believe that she can live her life independently (based on the option/opportunities they have), can she truly voice her opinions and views. More so, the rhetoric of raising voice for women would not work much if nothing is done on ground. And on ground work entails providing opportunities to women in all walks of their life. Their potential needs to be harnessed in different directions. The stigmatization of work associated with your gender needs to be done away with. Women need to be given opportunities on equal terms and conditions as of men. It is only when you bring the women in the mainstream of hustle and bustle, will you be able to truly voice for women rights. The Muslim Personal Law (Shariat) Application Act or Act XXVI of 1937 was enacted by the British government in India, as a part of the Government of India Act, 1935. After independence, the Constitution of India has maintained the law as it existed at the time of its introduction. Under the Constitution, Muslim law has been recognised only in respect of marriage and divorce, infants and adoption of minors, intestacy of wills, successions, joint family and partitions. Shariat or Muslim law in India does not apply to crimes. The point to be noted here is that the Muslim Personal Law (MPL) is a creation of colonial British rule. Muslim personal law was applied to Muslims in British India as a matter of policy and not as a matter of religion. The elements of this law, like ‘justice, equity and good conscience’ are not based on Shariat and therefore incorporated later. On 26 January 1950, the Indian Constitution gave legal sanction to the existing MPL and simultaneously also put forth the idea of the UCC in Article 44 of the Directive Principles of State Policy. In 1954, the government of India passed the Special Marriages Act, which actually provided people a choice of coming out of personal laws. 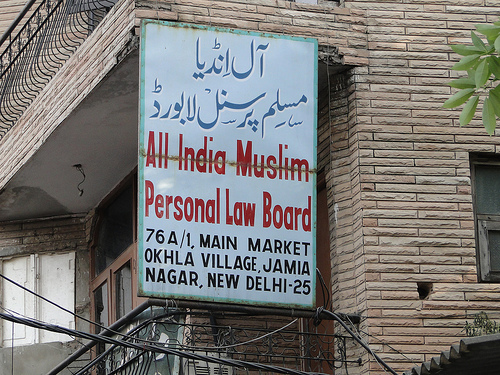 The Muslim personal law board of India (MPLB) was setup in 1972, in light of protecting the Muslim personal law from the repercussions arising out of UCC debate at that time. And therefore since then, the MPLB has existed as a major rallying point for conservative Muslims, though many progressive Muslims have questioned MPLB’s legitimacy in representing the overall Muslim population in India. There are some provisions in the MPL which are not on the lines of gender equality and therefore some provisions need major overhaul. Some of the provisions which need change are — oral divorce, polygamy and right to maintenance. The landmark Shah Bano case of 1985, brought to light many issues and more importantly opened the floor for debate on Muslim Personal Law. This case was a milestone in Muslim women’s search for justice. A 60 year old woman went to court asking for maintenance from her husband who had divorced her. The court ruled in her favor. The woman was entitled to maintenance from her ex-husband under Section 125 of the Criminal Procedure Code (with an upper limit of Rs. 500 a month) like any other Indian woman. The very debate which sparked in the aftermath of this case brought this issue into political sphere. At the very face of it, the case seemed like a threat to the Islam, as has been propagated by the voluble orthodoxy. The biggest political turmoil took place when, the congress government, panicky in the election year (1986), enacted the Muslim Women (Protection of Rights on Divorce) Act, 1986. The most controversial provision of the Act was that it gave a Muslim woman the right to maintenance for the period of Iddat (about three months) after the divorce, and shifted the onus of maintaining her to her relatives or the Wakf Board. The judiciary’s response to status of women under Muslim Personal Law has been ambivalent but on the touchstone of fundamental rights. The constitutional validity of Muslim Women ( Protection of rights on divorced) Act 1986 was challenged, in the ground that it infringed article 14, 15 and 21 o the Indian Constitution. Court remarked that the legislature doesn’t intend to enact an unconstitutional law, but having said that; this in itself is not the ground for upholding an act constitutional. The court imposed a seal of the constitutional validity of the statue. Supreme Court upheld that the payment of trifling amounts of ‘mehr’ to a divorced Muslim woman is not a substitution for maintenance. The court held that for Talaq to be effective, it has to be explicitly pronounced. Therefore, through some of such cases we can analyze the trend of judiciary in recognizing the status of women in Muslim community, on the lines of a global independent human being. Life with dignity, Economic and Political Weekly, page 44, Vol. 44, No 44 (Oct, 2009). Alka Singh, women in Muslim Personal law, Rawat publication New Delhi, 1992. Asghar Ali, The Right of women in Islam, 1996, New Delhi page 159. Nanda Chiranjeevi Rao, presumption of marriage under Muslim Law, Indian bar review, page 133, Vol. 39, issue 4, 2012. Kusum, Cases and Material on Family law, page 413 & 414. Universal Law publishing co. 3rd ed. 2013. Vimal Balasubrahmanyam, Women, Personal Laws and the struggle for secularism, Economic and Political Weekly, Page 1216, Vol. 20 no 30 (July 27, 1985).